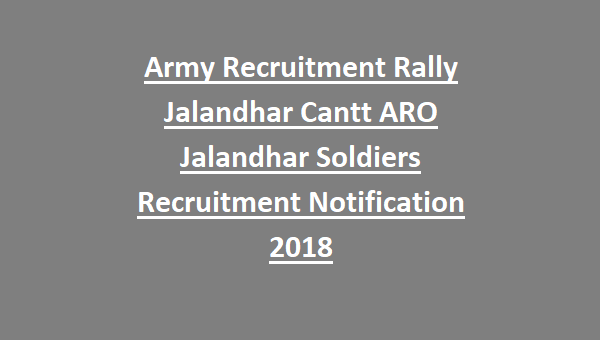 Army Recruitment Rally Jalandhar Cantt ARO Jalandhar Soldiers Recruitment 2018: Army Recruiting Office, Jalandhar released a Recruitment Rally notification inviting eligible candidates of districts Kapurthala, Shahid Bhagat Singh Nagar, Jalandhar and Hoshiarpur to contend for the post of Soldier under cadres namely General Duty, Technical, Clerk and Sepoy Pharma. Candidates applying for Soldier Jobs under General Duty must not exceed the upper age of 21 years, Sepoy Pharma maximum age limit is 25 years and for rest of the posts applicant must be below 23 years as reckoned on 01-09-2018. Sepoy Pharma: Passed 12th class with Physics, Chemistry, Biology and English. Candidates who have secured B.Pharma are also eligible. Candidates qualifying the Physical Fitness Test will be put through a detailed Medical Examination. A Common Entrance Exam will be conducted for all cadres based on syllabus as per the educational standards prescribed for the post. Candidates interested to serve Indian Army as Soldiers can attend the Army Recruitment Rally at Jalandhar Cantt by filling the online application form through the official website http://www.joinindianarmy.nic.in/ before the due date i.e. 16th November 2018. 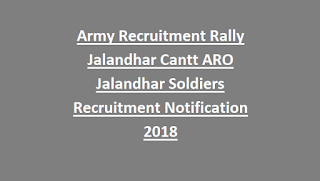 Candidates interested to participate in the Army Recruitment Rally Jalandhar Cantt ARO Jalandhar Soldiers for Soldiers Post can refer the official notification.